Hey, here’s an interesting question – which came first, Romania or Moldova? I realize that the photograph shown above looks like it is about 50 years old, but it is actually a photograph of a newspaper from 2014. During the run-up to the parliamentary election season in November last year I got a lot of printed material from the various political parties. 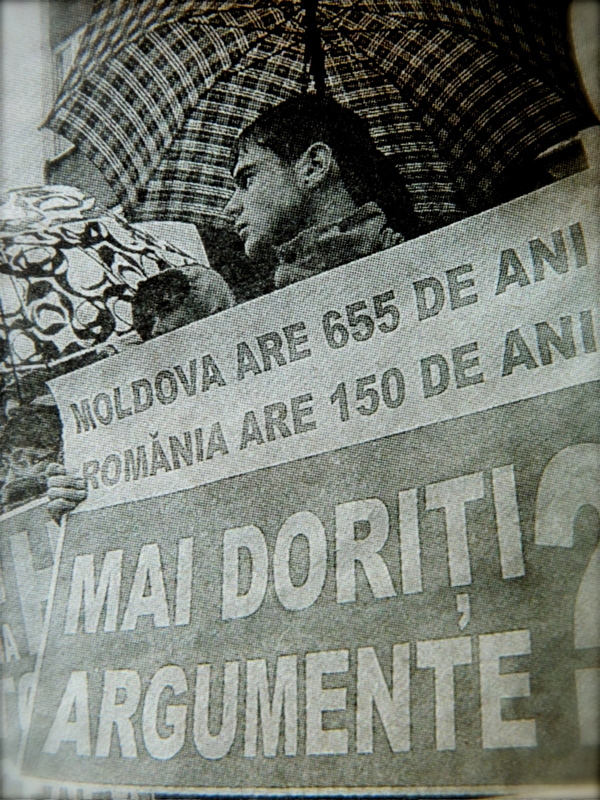 One day all my collected memorabilia will be in a museum, I am sure, but for now I am interested in the statement on the man’s poster – Romania is 150 years old while Moldova is 655 years old. Is this true? Is Moldova Romania’s big brother? As President Clinton said, it all depends on what your definition of a country is. A long, long time ago in a galaxy far, far away, neither Romania nor Moldova existed. If you believe the reports, the Romanian people existed, but it was in some kind of proto-form where they spoke an amalgamation of Latin and other local tongues while they gently crafted together what it means to be a modern Romanian. At some point, however, the southeast part of what is now Romania became Wallachia. Romanians today call it Tara Romaneasca, or “Romanian Land”, founded by the legendary king Basarab. Unfortunately for modern scholars, there’s almost no contemporary documentation on Basarab so the details of his life and accomplishments have to remain mostly in the realm of legend. What we do know, however, is that Romanians were in leadership positions over their fellow ethnic Romanians in Wallachia first. Much, much later, a renegade Romanian living under Hungarian leadership decided to branch out and take a slice of countryside for himself. Luckily for he and his followers, his mini rebellion mostly succeeded, and thus he founded the principality of Moldova (655 years ago). Through various wars, conquests, rebellions and famines, a wide host of foreign powers came to dominate over both Wallachia and Moldova, until Fortune smiled on the Romanian people around 150 years ago, when their two (mostly) independent principalities joined forces under one leader. This, then, is the foundation of the Kingdom of Romania, which appeared on the scene 150 years ago. But wait, the Kingdom of Romania also incorporated some parts of the (older) Moldovan principality, so did the Kingdom of Romania “inherit” the antiquity of Moldova when it united with Wallachia? Or did somehow Moldova keep its own separate history while contemporaneously joining with Wallachia? Furthermore, the Moldova that was founded 655 years ago doesn’t exist anymore. The country is named after the Moldova River, which is currently inside of Romania. So not one part of Moldova (the modern country) even touches the Moldova River, so it is still the same Moldova that was founded 655 years ago? And do periods of foreign conquest “reset the clock” in terms of antiquity? Does a country get to continue to keep numbering their years of existence if they are a vassal of a foreign power, ruled by Turks, Greeks or Russians in a distant capital? If you do get to include all the years, then doesn’t that make Wallachia the older cousin of Moldova? Surely there can be no disputing that the legendary King Basarab (and his less-legendary followers) were the first Romanians to enjoy sovereign rule over their ethnic kin. So that would make Wallachia indisputably older than Moldova, right? But wait! The poster isn’t comparing Moldova to Wallachia, it’s comparing Moldova to Romania. All the people living in the various lands (including Transylvania, Cernauti, etc) were always ethnic Romanians, but it wasn’t until about 150 years ago that any kind of political entity named Romania came into existence. So that makes it true then that Moldovans started ruling themselves earlier (655 years ago) than one supreme leader ruled over all ethnic Romanians (150 years ago, with the unification of the Wallachian and Moldovan principalities). Hold on a second though! That’s like saying the county (judet/raion) came before the state (country), right? That’s like saying France is older than the European Union. Of course it is, because the European Union is a larger administrative unit than France, so France necessarily came first (and is therefore older). On top of that, there is also the confusing aspect of parts of what used to be Moldova are now part of Romania (and Ukraine), and the part of Moldova that is now Moldova (i.e. the modern Republic of Moldova) was a sparsely inhabited backwater when Moldova was founded. All the “good” cities, such as Iasi, Suceava and Cernauti, aren’t even part of Moldova anymore even though they were the historical sources for riches and prestige for the Moldovan principality of antiquity (the one that was founded 655 years ago). And if we really want to be pedantic about everything, when the Kingdom of Romania was formed, the vast majority of the wealth and industry came from Moldova. After all, it was the ruling nobles of Wallachia who decided to ask the Moldovan prince A.I. Cuza to rule over them, making the Romanians the junior partner in the newly united kingdom. Furthermore, the Romania of 150 years ago is vastly different from Romania after World War 1 (with the acquisition of Transylvania, Banat, Maramures and Crisana) which in turn is vastly different than Romania after WW2 (no more Cernauti, no more Republic of Moldova). So which of these vastly different configurations can be said to be directly inherited from the events of 150 years ago? I say that this issue is endlessly debatable because both litigants have strong arguments in their favor. For Moldovans, it’s easy to understand how they feel that they – and their culture – are the big brother to Romania, as it was a series of intrepid Moldovan kings who firmly planted a strong essence of religion and culture in this lands, leading to a prosperous nation that generously included their younger brethren 150 years ago under a harmonious united rule. For Romanians, it’s indisputable that the first ethnic king to rule over Romanians was the legendary king Basarab and his numerous descendants. This makes Wallachia the true fountainhead for Romanian identity. Cult heroes like Vlad “Dracula” Tepes stoutly defended the Romanian people from an onslaught of hostile outsiders until 150 years ago, when Moldova wisely decided to unite with their big brothers to form a proud, strong, powerful nation. endless are the arguments of magesmoldovaromaniawhich is older? Next Post Read my TWO new books for free! Did the Moldovans have a flag 665 yeats ago? Of course this Moldova is older business in the .md newspapers is just ruski propaganda designed to somehow turn us Romanians and Mildovans against each other. Putin’s “news” agencies and army if trolls us also enciuraging Texas right wingers to secede from the US. Very detailed! I felt a strong sense of national pride from the locals when I went to romania last year.